Selective Pallet Racking, more commonly known as Adjustable Pallet Racking, is the most popular and economical form of industrial pallet racking on the market. Warehouses and other storage facilities with restrictive space benefit most from Selective Pallet Racking. They provide 100% selective storage up to 12.8m in height, utilising valuable vertical space. Storeplan has its client’s best interests at all times. As one of Australia’s leading selective pallet racking suppliers, we have the resources and expertise to provide our clients with the most cost-effective and practicable solutions. In our decades of service, we’ve provided numerous industries across Australia with bespoke industrial pallet racking systems. If you have specific requirements, our team of experts will review the range of storage systems available. 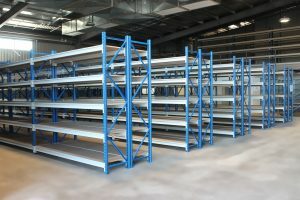 Suitable storage racking from our large range can be designed, sourced and customised to meet any pallet size or weight to provide the best racking system solution. Selective Pallet Racking is most suitable for warehouse and workshop racking, garage and/or farm shed storage, in processing and manufacturing facilities for storage of finished products and much more. Our Selective Pallet Racking storage system is versatile and can be used in conjunction with all types of lift trucks and most handling equipment for warehouse goods. If you have a small warehouse, large storage facility, medium sized workshop or a farm storage shed, the Selective Pallet Racking is your partner in efficient and safe storage. Feel free to send your enquiries to the Storeplan team. We are more than willing to help you figure out which warehouse pallet racking system is suitable for your working conditions. If you have enquiries regarding quotes and site measure-ups, feel free to contact us today. 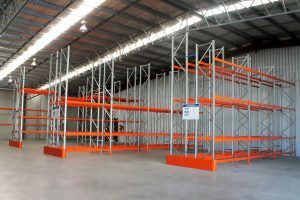 We Supply, Deliver & Install pallet racking projects all over Australia including: Rockhampton QLD, Sydney, Melbourne, Adelaide, Dubbo, Wagga Wagga, Rockhampton, Gladstone, Brisbane, Mt Isa. Storeplans industrial barrier solution provides a safe segregation of vehicles and people. 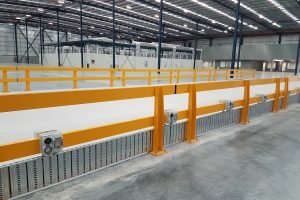 These barriers create a strong physical boundary between pedestrians and moving equipment such as forklifts, toe tugs and other vehicles used inside industrial warehouses and facilities. The barriers provide protection against vehicles moving into a designated walkway and conversely limits pedestrians from moving outside their designated path. 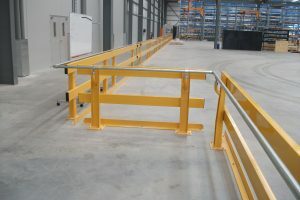 The barriers are made of robust steel that will withstand the impact of a forklift driving into the barrier; without the barrier falling over. 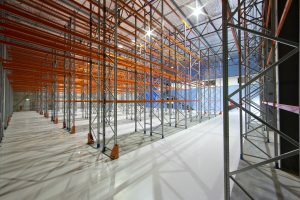 permits fast and safe stacking in both pallet racking and unit stacking. Lids, tipping bars, liquid bungs, hotstamping, barcoding and numbering are all available at your request. 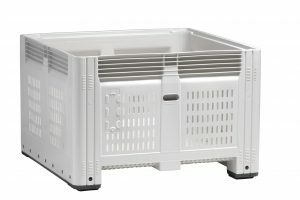 Solid & Vented Megabins are 1162mm L x 1162mm W x 730mm H.
Solid Bins have a capacity of 720L. Longspan Shelving is an easy, clip-together shelving system suitable for storage of small parts, right through to heavy and bulky items. With shelf capacities of up to 500kg per level and a wide range of accessories available, it can be configured to suit many applications! 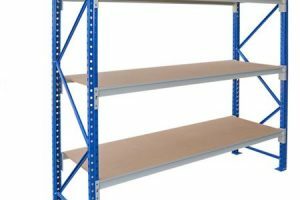 Whether you are setting up a completely new warehouse, fitting out a shipping container or are simply looking for a quality storage system for your workshop, parts store or even your back shed, there are numerous ways in which LS600 longspan shelving can be configured to suit your exact requirements. The team at Storeplan is dedicated to providing you with the shelving solution you need – we are committed to making your job easier by offering an obligation free site visit, layout planning and quoting service. Once the ultimate layout is created Storeplan will then supply, deliver and install… but our service doesn’t stop there…we will then provide ongoing auditing and servicing of your shelving requirements. Can be used to support a mezzanine floor system! Mobile bays – Using heavy duty castors for moving about! Use Stack n Nest Crates to create a secure storage system – can even have it colour coded! BEAMS: Longspan beams are available in 1200, 1800 & 2400mm widths.